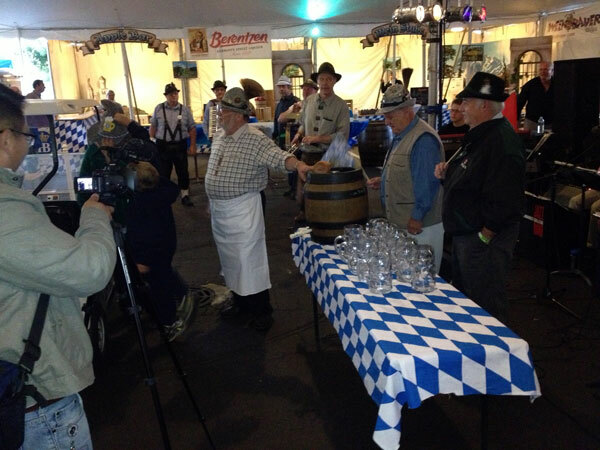 As I expressed last year, the Glendale Heights Oktoberfest replicates almost everything you would expect to see in the tents in Munich and this year they went even further. I had the luxury of being able to attend on Friday, September 13th and being able to join the opening parade and see the ceremonial keg tapping. Chef Wolfgang and crew put on an exceptional Oktoberfest. The tent is the same as last year but the arrangement this year is so much better. Upon walking into the tent you are greeted with a very Bavarian feeling. The ticket booth that sells the food and drink tickets has the look and feel of Bavaria. Looking right and left you see a number of booths that offer German and Oktoberfest items including clothing, hats, steins and more. The ticket system they use is straight forward and it was great that they accepted credit and debit as well as cash. Each ticket is worth a dollar and can be used for food or drink. After purchasing tickets and leaving the ticket booth area you open up to the rest of the tent which is set up in a way that would make any Munich Oktoberfest host proud. 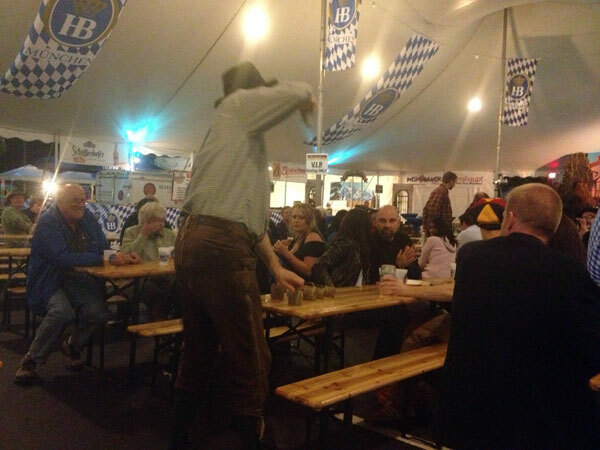 The entire middle section of the tent is comprised of authentic Oktoberfest biergarten tables like you would use in Munich. The stage is on the far end of the tent and can be seen from every seat and there is even an outside biergarten area just outside the tent. One quintessential part of Oktoberfest is drinking beer from a Maß and Glendale Heights Oktoberfest did one better than last year. This year they again offered the half liter glass as well as a real glass Hofbräu Maß. The beer prices were reasonable: $15 for a half liter of beer and the glass, $25 for a liter of beer and the Maß. Refills are $7 for a half liter and $14 for a full liter. If you opt to not buy a real glass, all beer was $7 for a 16 ounce plastic cup. If I were to recommend a change I would suggest refills on the half liter glass or Maß be a dollar off the regular price so as to entice the people to purchase the glassware. Depending on the day, beer can be purchased from as many as three different locations within the tent greatly reducing the amount of time you will spend in line waiting for a beer. In addition to the beer there is a dedicated wine bar and café. The kitchen is easily recognizable on the right side of the tent and it is very easy to walk up and get food. They offer almost all the food you would expect to eat in Munich; soft pretzels and sausages to more traditional Oktoberfest items like roasted half chicken and the giant pork shank. They even had a kids menu to make it easier for parents. For the true Oktoberfest experience I would recommend the VIP package. The first two rows of tables are reserved for VIP’s and included in the package is VIP parking, an admission voucher, a meal voucher which includes an appetizer plate and dinner, as well as vouchers for two drinks. Here you will receive full service from a dedicated server who will fulfill all of your food and drink needs. You will also enjoy your meal on real China plates with real silverware and proper glassware. The price for the VIP package varies $60 Sunday - Thursday, $80 Friday - Saturday. I visited the event two different days and experienced it both ways and I would truly recommend the VIP package. One major change for this year was the event is no longer just one weekend but two weekends and the entire week in between. In addition to the longer event, they have also greatly improved on the entertainment which was really the only thing that I had a problem with last year. This year they are sticking with mostly German bands. The only exception is the Elmhurst Jazz Band that actually fits in quite well with the event since they had a set list of songs that you would hear in Munich. This year I really have no problems with the event and, in all honesty, the Glendale Heights Oktoberfest is probably my favorite Oktoberfest event in the Chicagoland area. It truly embodies all that is Oktoberfest and really brings me back to Munich.